For those who don’t know, hydroquinone is an aromatic organic compound and acts like a skin lightener. What is hydroquinone? What it isn’t? Why is hydroquinone so controversial anyway? Hydroquinone is a solid granular derivative of the primary compound of two hydroxyl groups bonded to a benzene ring. Sounds too complicated? Well, maybe it’s easier for you to keep in mind that hydroquinone isn’t a steroid, but sure acts like a strong agent when it comes to skin bleaching. Hydroquinone is a skin lightener that is used to control the excessive production and aggregation of melanin, aka hyperpigmentation, caused from different changes in your body or other reasons. In order to understand how hydroquinone really works, you need to know one or two things about melanin. It’s the melanocyte cells that produce melanin and they’re activated by tyrosinase, which is fact an enzyme. Do you know tan? Well, tan it’s actually the answer of melanin to the excessive production caused by the high amount of sunlight. When you start using a skin bleacher like hydroquinone, the skin gets back to its original tone as it’s the hydroquinone that stops the propagation of tyrosinase, delaying and eliminating the problems caused by melanin. It seems that is all hast started when hydroquinone got forbidden in South Africa some years ago. After stirring up the whole about it, it proved that all products in question were in fact based on glucocorticoids and mercury. The list of ingredients also included illegal contaminants, therefore the cause for the side effects wasn’t hydroquinone alone. Some countries in European Union soon followed South Africa, without even waiting for further studies and researches. By contrary, there are so many studies that prove that hydroquinone isn’t just efficient, but also safe to use. Truth be told, just like any other compound, hydroquinone does have some side effects, but they only appear when the application isn’t followed properly. As long as you stay informed and you’re using it how your dermatologist has told you, you shouldn’t worry about any side effects. Keep in mind that skin reacts differently and you should pay attention to yours. The very first sign of skin allergy or darkening should, however, send you to your physician for a consult. When you want to minimize the side effects of hydroquinone, using it according to your doctor’s orders. Hydroquinone is able to lighten dark spots on skin (typically known as hyperpigmentation, age spots, sun spots, melasma, freckles) with various causes. Hormone medicine, birth control pills, pregnancy or some injury to skin may lead to this type of skin conditions. What is hydroquinone doing it that it actually blocks the process in the skin that led to the discoloration in the first place. Always follow directions on the product package or apply exactly as your doctor told you. You should stay on the safe side and apply a tiny amount of the medicine on a healthy and unbroken area of your skin. Pay attention to it for the next 24 hours in case any side effects appear. Blistering, itching, redness or puffiness are always signs telling you not to start using the hydroquinone treatment. On the other hand, mild redness isn’t a big issue and places you on the safe side. In most cases, you should apply the 4% medication to the affected areas of your skin twice a day, or exactly how your doctor prescribed. Hydroquinone should only be used on the skin. Stay away from the eye area, but also on the inside of your nose and mouth. Should you ever get it in any of these areas, simply flush it with lots of water. As hydroquinone makes your skin more sensitive to the sun, it’s better to avoid as much as you can sun exposure, sunlamps and tanning booths. Better yet, always use sunscreen and use protective clothing on the treated areas. Try to help the hydroquinone cream and use it constantly, for best results. Additionally, give it around 2 months until you get to notice the improvements on your skin. If nothing happens or your symptoms actually get worse, you should get back and check it with your doctor. Even though most side effects of hydroquinone 4% depend a lot on how you’re playing it by the rules, we still have to mention them so that you can recognize the symptoms the second they appear. This is one side effect that may occur, according to both FDA and standard-setting agencies from various countries around the world. Ochronosis isn’t common, especially if you’re using an over-the-counter hydroquinone treatment, but the situation when people developed blue-black skin discoloration after using a treatment like this does happen. Ochronosis can also lead to gray-brown spots and small, yellowish brown bumps. Skin thickening may also occur. Nevertheless, ochronisis is more common for the dark-skinned people, when using hydroquinone 4% treatment for longer time. Most hydroquinone 4% topical solutions are going to make the skin more sensitive to sunlight. This is commonly known as photosensitivity. This is why, during a treatment like this, it’s important to stay away not only from the sun, but also from tanning beds and sunlamps. Wearing protective clothing and applying sunscreen when in sunlight are also essential for minimizing the risk for this type of side effect. Keep in mind that exposing yourself to ultraviolet light may lead to severe sunburn, when using hydroquinone treatment. Never apply hydroquinone to a skin that is sunburned, chapped, irritated or windburned as the risk for worsening the symptoms is really high. This is a bit unlikely, but some people may develop an allergic reaction to hydroquinone. Hives, stinging sensations, severe burning, trouble when breathing, swelling of face, throat or mouth are all signs of allergic reaction to hydroquinone. Always get to the emergency if you experience any of these previous symptoms. When you take orally hydroquinone in large amounts, hydroquinone becomes toxic. It can lead to unpleasant reactions like seizures, ears, nausea and also bluish skin caused by the smaller intake of oxygen in the blood (cyanosis). Taking hydroquinone orally can also lead to liver damage. If you know you’re in this situation, you shouldn’t take the hydroquinone for more than 5 days and no more than five different times during one year. Some rodent studies about the high doses of hydroquinone gives through a feeding tube helped about the possible relation to cancer. An FDA report on hydroquinone skin bleaching products showed there no carcinogenic properties have been linked to topical nor oral hydroquinone use in humans. In order to minimize side effects of hydroquinone 4% you need to follow some rules and to keep in mind few important things. Use a missed dose as soon as you remember. However, if that dose is close to the next one, it’s better to skip the missed dose and only get the usual dose. It’s never a good idea to double the dose in order to catch up. Hydroquinone may be uncomfortable to take when swallowed. You should always call 911 if someone overdoses or passes out/has trouble breathing. You can also call a poison control center in case of an overdose. The typical symptoms would be shaking and seizures. Hydroquinone treatment was prescribed especially for you, only for a current skin condition. Therefore, you shouldn’t lend it to anyone else nor use it for another skin condition. You should check it with your doctor should any other skin condition appears. You need to store hydroquinone away from light and moisture, at room temperature. Keep in mind that various forms of hydroquinone may require different storing conditions. Ask your pharmacist or read the product labeling for the right information. In order to always be safe, you shouldn’t store hydroquinone products in the bathroom or at reach for children and pets. Never flush the medications down the toilet, nor pour them into the drain. You need to discard it in a safe way when you no longer use it or it expired. Even though you may not develop an allergic reaction to hydroquinone, combining with the wrong medication could lead to some side effects. Therefore, it’s important to tell your doctor or pharmacist if you have any allergies that you know about. Some inactive ingredients (sulfites, for instance) can lead to allergic reactions. Your medical history is also to consider so you should tell your pharmacist about it. Asthma, various skin conditions (eczema, psoriasis) may be important for dosage. Additionally, it’s never a good idea to start/stop or even change the dosage of your treatment on your own, without talking to your doctor/pharmacist. Even though you may not be aware of, using some prescribed/non prescribed herbal products could interfere with hydroquinone. Play it safe all the way and list down all of your current medication and show it to your doctor/pharmacist. 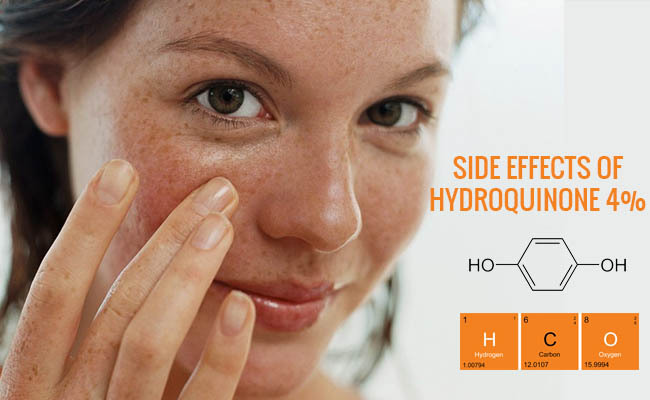 Hydroquinone 4% should be safe to use for most, but sometime it may lead to side effects. As long as you’re always checking it with your doctor/pharmacist and take it as he/she says, you shouldn’t worry much. PreviousPrevious post:Does Admire My Skin 2% Hydroquinone Dark Spot Remover Really Work?